Soaring pressure on manufacturing costs within the solar-power market is fueling competition in the manufacture of PV solar panels. The automated fabrication of PV modules improves efficiencies, product integrity, and reduces production overhead. By utilizing automated production lines, assembly time of a junction box to a PV panel can be considerably reduced. The introduction of new automated systems inevitably results in changed requirements in design of a mounting mechanism for an electrical junction box. After all, the PV modules have to survive 25-year customer warranties and maintain high standards of consistent performance. In a PV module, the quality of the interconnections is often the most critical point for the performance and lifetime of the module. Many of the potential problems only show up after several years. If lower quality is employed, defective electrical connections may lead to a fire in the junction box. 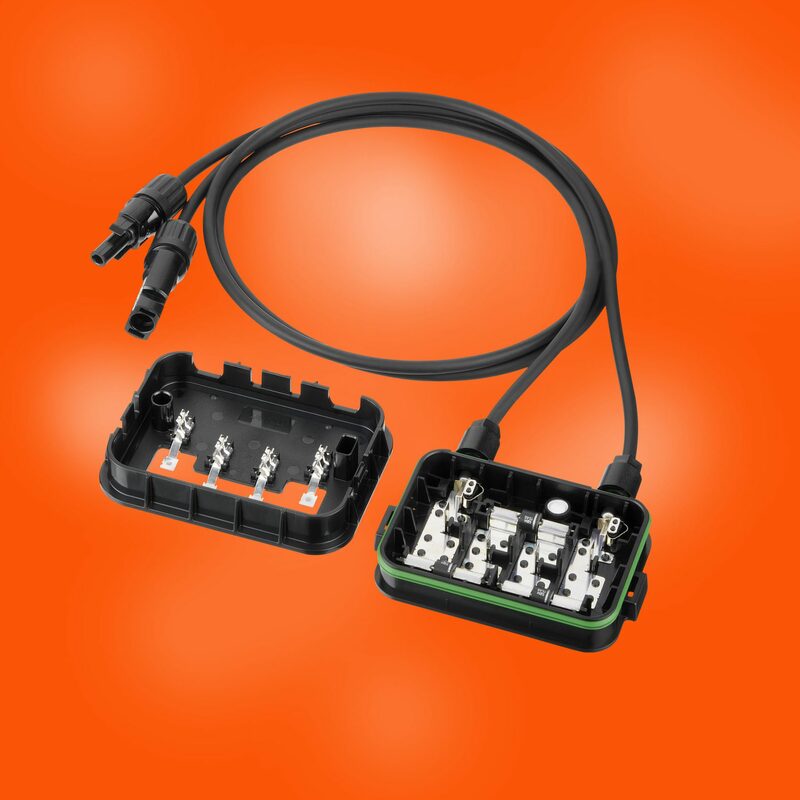 The Molex SolarSpec™ PV Junction Boxes are soldered to the PV Panel ribbons, as soldered connections are the safest and most reliable connections, rather than relying on clamped joints that are still used in many hand assembled Junction Boxes. As one of the world’s largest connector manufacturers, Molex welcomes these challenges. To address the issues relevant to the PV module industry, such as high quality, long product lifetime, automatic pick-and-place, hostile environments, heat dissipation, etc., Molex can call upon a variety of well established in-house technologies and solutions that have already met the challenging requirements over many years in other markets such as data systems, automotive, the commercial vehicle sector and factory and process automation. Working closely with leading module manufacturers, Molex has developed a new SolarSpec junction box for fully automated module production. The first objective was to create a product that would be as all-purpose, reliable and attractively priced as possible, while addressing a wide diversity of customer concerns and still allowing any customer-specific requirements to be implemented. First, a completely new board termination system was designed for the base part of the two-piece SolarSpec junction box. In the lower section of the box there are formed springs, which make direct contact with the exposed conductor strips on the PV panel. Wide-open contact cavities allow the user to visually inspect the connection points after positioning and soldering on the PV module. The part can be placed onto the PV module by pick-and-place equipment or industrial robot. The contact springs are then spot welded to the conductor strips by means of an automated solder process. The Molex Solder Charge™ SMT Technology facilitates high-speed assembly and eliminates the need for hand-soldering of the ribbon. Manual interventions, such as up righting and pre-positioning of the panel-side conductor strips are no longer required. High speed automated assembly is then possible, with minimum risk of operator error. Inductive soldering is obviously the most appropriate solder technology as it is a highly reliable and reproducible process. The soldering cycle time is only ~2,5 seconds per contact. The low profile of the inductive soldering equipment allows for easy line integration regardless of whether a customer wants to operate the junction box assembly in a semi- or fully-automated process. Finally, the assembly time of the junction box can be significantly reduced to 60 seconds and below. The cover of the Molex SolarSpec junction box, which contains the bypass diode connections, the moisture protection filter and the PV cable terminals, can simply be placed on top of the base part, which is already installed on the PV module. This operation can likewise be automated as part of the production sequence. In the event of subsequent servicing, the junction box can be re-opened and closed without impairing the system’s water-tight interface. IP65 compliance is achieved by a lip seal running round the lower section. The upper and lower section of the junction box interlocks via a clip mechanism positioned on the left and right-hand side of the junction box. The system can be opened with or without a special tool depending on customer requirements. The clips also serve as a pre-centering aid so that the upper and lower section can be easily brought together and securely interlocked during automatic placement. Furthermore, the asymmetrical polarized arrangement of the locking clips prevents the upper section from being incorrectly fitted. The junction box contains bypass diodes to protect the PV panel from reverse current during hours of darkness, shade or when covered by leaves or other debris. A breathable membrane protection filter in the upper section of the junction box prevents the ingress of moisture and protects against build up of hazardous condensation in the interior. The membrane filter is heat staked into position and is therefore permanently attached to the molded housing. The compact design of the Molex SolarSpec junction box ensures smooth and uninterrupted component feeding in the pick-and-place robotic assembly process, thus guaranteeing precise positioning of the junction box on the PV module. Another important factor in the junction box design was the optimization of external dimensions. Weight and a minimized component count also provides an elegant and cost-effective solution to associated heat dissipation problems. Equally important are the machine friendly packaging aspects of components. Parts must meet the customer’s particular requirements so they can be presented to the pick-and-place machines without further repacking. Stackable recyclable trays are generally used. Securing and sealing of the junction box on the PV module can be completed, as before, with silicone, which must be applied prior to mounting. Alternatively, to facilitate automated assembly of the box to the PV panel, adhesive double sided tape can also be pre-assembled by Molex so that only the protective foil needs to be removed prior to mounting. This eliminates the time-consuming application of silicone and especially the time required for the silicone to cure. The SolarSpec Junction Box assembly is supplied with two removable DC cables available in dual-qualified (TUV and UL) or single-qualified (TUV). Cables are equipped with the Molex MC4 style DC-Connectors. For more information please visit http://www.molex.com/link/solarjunctionbox.html.